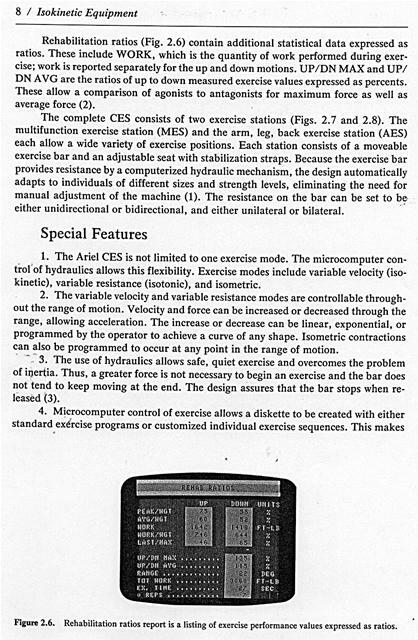 The Ariel Computerized Exercise System (CES) is an advanced system that automatically monitors, controls, and modifies resistance and velocity while the user is exercising. It is a computerized hydraulic system and is superior to many hydraulic systems in that it is not limited by a fixed flow rate through the valve. 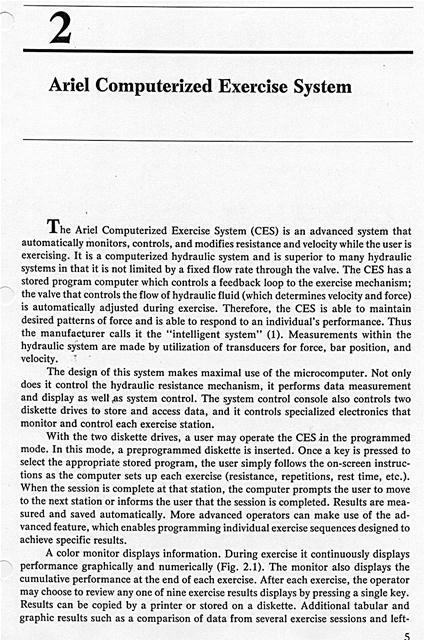 The CES has a stored program computer which controls a feedback loop to the exercise mechanism; the valve that controls the flow of hydraulic fluid (which determines velocity and force) is automatically adjusted during exercise. Therefore, the CES is able to maintain desired patterns of force and is able to respond to an individual's performance. Thus the manufacturer calls it the "intelligent system" (1). Measurements within the hydraulic system are made by utilization of transducers for force, bar position, and velocity. The design of this system makes maximal use of the microcomputer. Not only does it control the hydraulic resistance mechanism, it performs data measurement and display as well ,as system control. The system control console also controls two diskette drives to store and access data, and it controls specialized electronics that monitor and control each exercise station. With the two diskette drives, a user may operate the CES in the programmed mode. In this mode, a preprogrammed diskette is inserted. Once a key is pressed to select the appropriate stored program, the user simply follows the on-screen instructions as the computer sets up each exercise (resistance, repetitions, rest time, etc.). When the session is complete at that station, the computer prompts the user to move to the next station or informs the user that the session is completed. Results are measured and saved automatically. More advanced operators can make use of the advanced feature, which enables programming individual exercise sequences designed to achieve specific results. Figure 2.1. Display during exercise provides information about force, work, repetitions, and elapsed time. right comparisons may be printed or saved. A printer buffer allows the exerciser to continue while results are being printed. The desired exercise results to be viewed or printed are selected from a results menu (Fig. 2.2). A brief description of commonly saved results follows. The average curve plot (Fig. 2.3) is a graphic display of force through the range of motion. This curve is an average for all repetitions in the set of exercise. Results of three separate exercise sessions can be displayed for comparison. Rehabilitation curves (Fig. 2.4), commonly known as force curves, are a graphic display of force plotted against time for each individual repetition. Range of motion plotted against time is also displayed. Rehabilitation statistics (Fig. 2.5) are a statistical analysis of various parameters of- movement. Results of the up and down motion of the exercise are listed separately along with RMS (a statistical measure of variance from the average). A few of the more commonly used statistical measurements will be briefly explained. PK VAL and AVG VAL are the peak and average exercise values (either force or velocity). PK PWR and AVG PWR are the peak and average power values. POS(PK) is the point in the range of motion where peak force or velocity occurred. PK HOLD is the amount of time peak force or-velocity was held. RECIP is the amount of time it takes for the user to reciprocate motion, i.e., to change from the up to the down direction. Figure 2.2. Exercise results are reported in nine different formats. Figure 2.3. Average curve plot graphically illustrates average force through range of motion and can optionally compare values with previous performance. Figure 2.4. 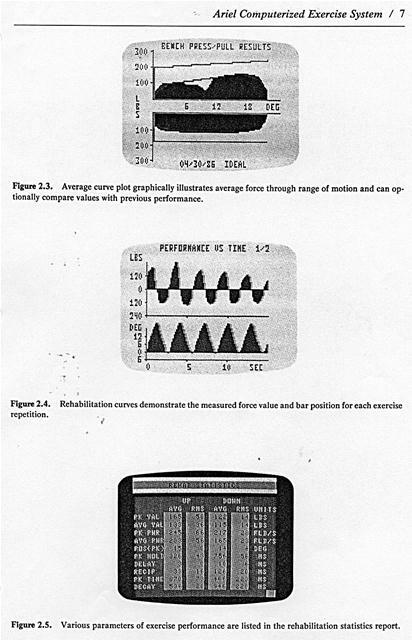 Rehabilitation curves demonstrate the measured force value and bar position for each exercise repetition. Figure 2.5. Various parameters of exercise performance are listed in the rehabilitation statistics report. Rehabilitation ratios (Fig. 2.6) contain additional statistical data expressed as ratios. These include WORK, which is the quantity of work performed during exercise; work is reported separately for the up and down motions. UP/DN MAX and UP/ DN AVG are the ratios of up to down measured exercise values expressed as percents. These allow a comparison of agonists to antagonists for maximum force as well as average force (2). The complete CES consists of two exercise stations (Figs. 2.7 and 2.8). The multifunction exercise station (MES) and the arm, leg, back exercise station (AES) each allow a wide variety of exercise positions. Each station consists of a moveable exercise bar and an adjustable seat with stabilization straps. 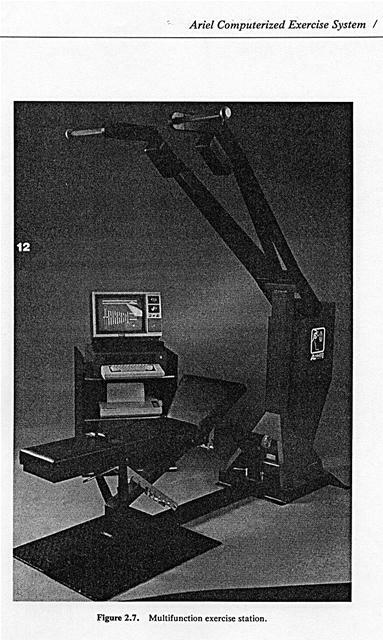 Because the exercise bar provides resistance by a computerized hydraulic mechanism, the design automatically adapts to individuals of different sizes and strength levels, eliminating the need for manual adjustment of the machine (1). The resistance on the bar can be set to be either unidirectional or bidirectional, and either unilateral or bilateral. 1. The Ariel CES is not limited to one exercise mode. The microcomputer control'of hydraulics allows this flexibility. Exercise modes include variable velocity (isokinetic), variable resistance (isotonic), and isometric. 2. The variable velocity and variable resistance modes are controllable throughout the range of motion. Velocity and force can be increased or decreased through the range, allowing acceleration. The increase or decrease can be linear, exponential, or programmed by the operator to achieve a curve of any shape. Isometric contractions can also be programmed to occur at any point in the range of motion. 3. The use of hydraulics allows safe, quiet exercise and overcomes the problem of inertia. Thus, a greater force is not necessary to begin an exercise and the bar does not tend to keep moving at the end. The design assures that the bar stops when released (3). Figure 2.6. Rehabilitation ratios report is a listing of exercise performance values expressed as ratios. Figure 2.7. Multifunction exercise station. Figure 2.8. Arm, leg, back exercise station. for ease of use by the physical therapist and allows the user to be as independent as possible. Set up time for each exercise is minimal. 5. The microcomputer and the sophisticated software allow the user to save, compute, print, and compare results data. The operator never needs to spend time calculating results and may view or print results after the user has completed the session. pare current and previous performance data in color graphic form on the monitor after each exercise (Fig. 2.9). The operator may also preprogram target values which appear on the screen as the user is exercising. 7. A "pyramid" option allows the force or velocity to change from repetition to repetition within a set. Thus, the operator may program an exercise to get progressively easier or more difficult as the user exercises. 8. The "automatic" option changes force or velocity in a permanent manner from session to session. 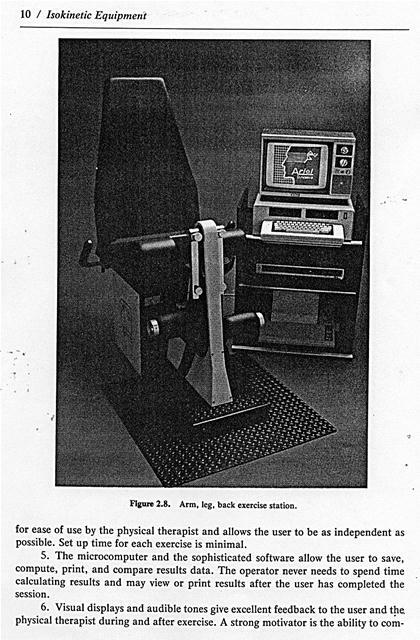 The operator may increase or decrease repetitions, quantity of work, percent fatigue, or exercise time from session to session. The manufacturer has provided abstracts of two separate studies of reliability and validity of the Ariel CES. The first study, done by the Department of National Defense in Canada (4), studied force measurement and angular velocity. 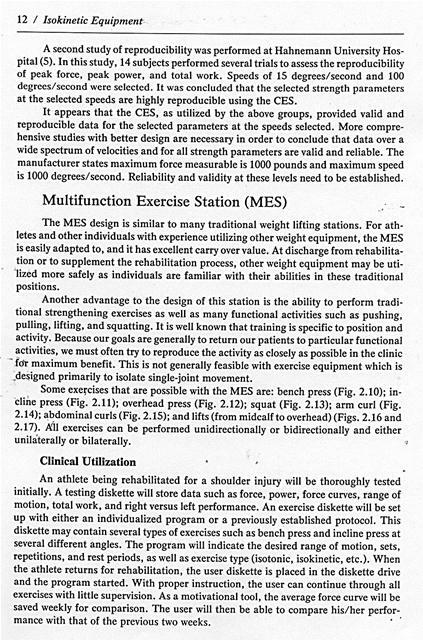 Force measurement was examined by comparing the CES readout of an applied force to known calibration weights applied to the CES. Angular velocity was examined by comparing various velocities selected through software commands to the actual velocity measured with a microswitch activated timer. Intrasubject reproducibility was also studied. Their conclusion was that force measurements and angular velocities are valid and reproducible with the CES if the system is calibrated daily according to manufacturer's specifications (4). Figure 2.9. Average force curve for leg extension/flexion (solid graph) with a comparison to a previous session (line). A second study of reproducibility was performed at Hahnemann University Hospital (5). In this study, 14 subjects performed several trials to assess the reproducibility of peak force, peak power, and total work. Speeds of 15 degrees/second and 100 degrees/second were selected. 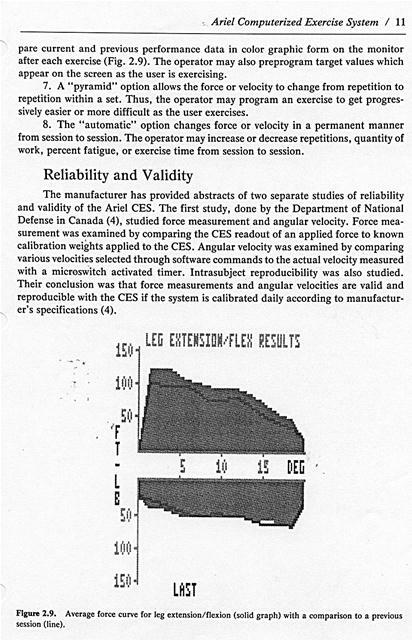 It was concluded that the selected strength parameters at the selected speeds are highly reproducible using the CES. 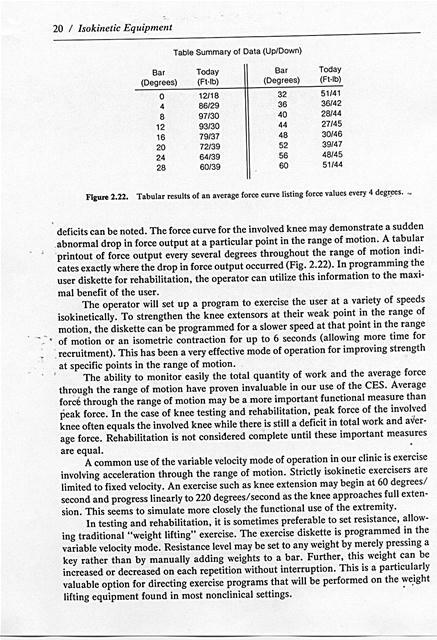 It appears that the CES, as utilized by the above groups, provided valid and reproducible data for the selected parameters at the speeds selected. More comprehensive studies with better design are necessary in order to conclude that data over a wide spectrum of velocities and for all strength parameters are valid and reliable. The manufacturer states maximum force measurable is 1000 pounds and maximum speed is 1000 degrees/second. Reliability and validity at these levels need to be established. The MES design is similar to many traditional weight lifting stations. For athletes and other individuals with experience utilizing other weight equipment, the MES is easily adapted to, and it has excellent carry over value. At discharge from rehabilitation or to supplement the rehabilitation process, other weight equipment may be utilized more safely as individuals are familiar with their abilities in these traditional positions. Another advantage to the design of this station is the ability to perform traditional strengthening exercises as well as many functional activities such as pushing, pulling, lifting, and squatting. It is well known that training is specific to position and activity. Because our goals are generally to return our patients to particular functional activities, we must often try to reproduce the activity as closely as possible in the clinic fdr maximum benefit. This is not generally feasible with exercise equipment which is .designed primarily to isolate single-joint movement. 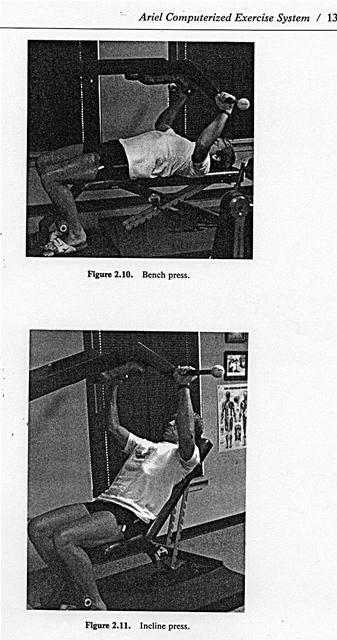 Some exercises that are possible with the MES are: bench press (Fig. 2.10); incline press (Fig. 2.11); overhead press (Fig. 2.12); squat (Fig. 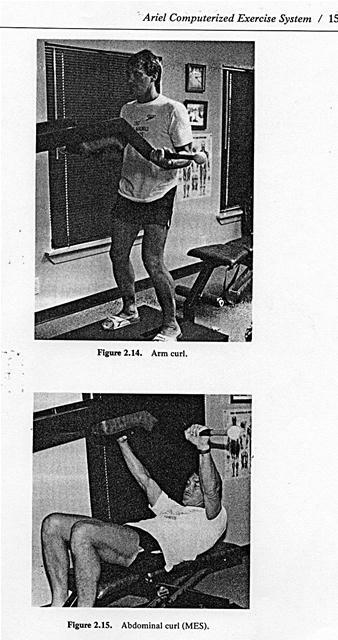 2.13); arm curl (Fig. 2.14); abdominal curls (Fig. 2.15); and lifts (from midcalf to overhead) (Figs. 2.16 and 2.17). All exercises can be performed unidirectionally or bidirectionally and either unilaterally or bilaterally. An athlete being rehabilitated for a shoulder injury will be thoroughly tested initially. A testing diskette will store data such as force, power, force curves, range of motion, total work, and right versus left performance. An exercise diskette will be set up with either an individualized program or a previously established protocol. This diskette may contain several types of exercises such as bench press and incline press at several different angles. The program will indicate the desired range of motion, sets, repetitions, and rest periods, as well as exercise type (isotonic, isokinetic, etc.). 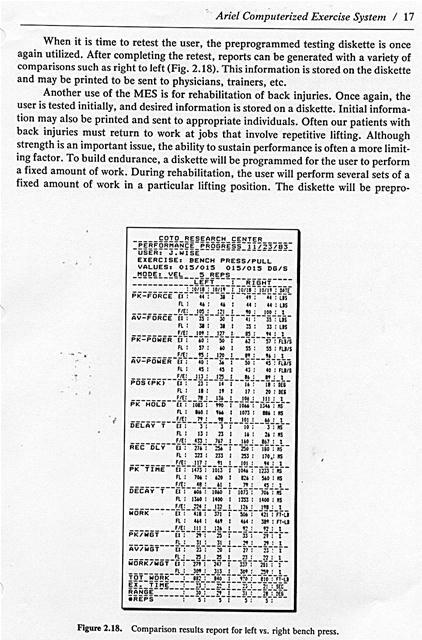 When the athlete returns for rehabilitation, the user diskette is placed in the diskette drive and the program started. With proper instruction, the user can continue through all exercises with little supervision. As a motivational tool, the average force curve will be saved weekly for comparison. The user will then be able to compare his/her performance with that of the previous two weeks. Figure 2.15. Abdominal curl (MES). When it is time to retest the user, the preprogrammed testing diskette is once again utilized. After completing the retest, reports can be generated with a variety of comparisons such as right to left (Fig. 2.18). This information is stored on the diskette and may be printed to be sent to physicians, trainers, etc. Figure 2.18. Comparison results report for left vs. right bench press. grammed to increase this amount of work by a set amount each session so that the workload becomes progressively more difficult. The fatigue mode is another method of building endurance. The diskette is programmed such that exercise continues until two consecutive repetitions fall below a preset level. If 75% is the chosen value, the exercise set ends when the force of two repetitions goes below 75% of maximum. 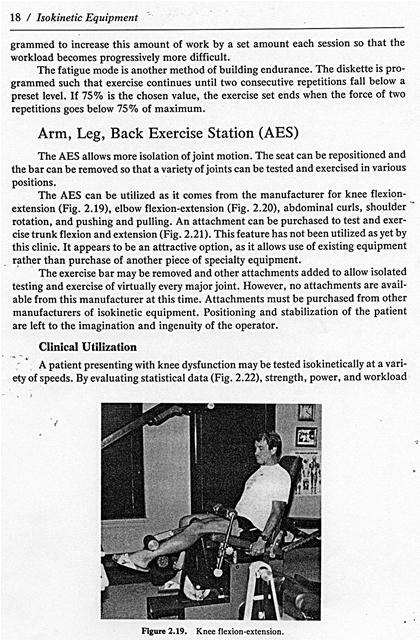 The AES allows more isolation of joint motion. The seat can be repositioned and the bar can be removed so that a variety of joints can be tested and exercised in various positions. The AES can be utilized as it comes from the manufacturer for knee flexionextension (Fig. 2.19), elbow flexion-extension (Fig. 2.20), abdominal curls, shoulder rotation, and pushing and pulling. An attachment can be purchased to test and exercise trunk flexion and extension (Fig. 2.21). This feature has not been utilized as yet by this clinic. It appears to be an attractive option, as it allows use of existing equipment rather than purchase of another piece of specialty equipment. The exercise bar may be removed and other attachments added to allow isolated testing and exercise of virtually every major joint. However, no attachments are available from this manufacturer at this time. 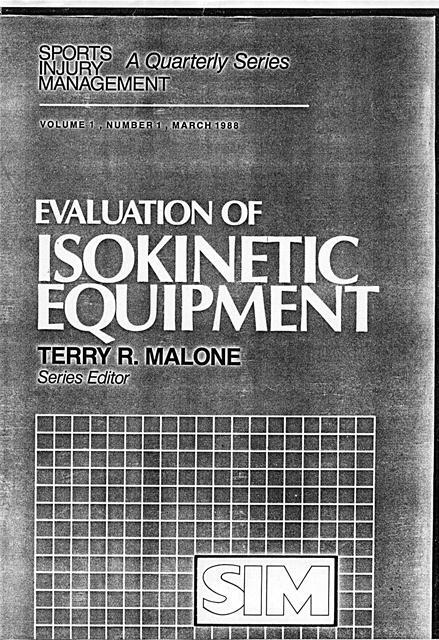 Attachments must be purchased from other manufacturers of isokinetic equipment. Positioning and stabilization of the patient are left to the imagination and ingenuity of the operator. Figure 2.21. Back attachment to test and rehabilitate trunk flexion-extension. deficits can be noted. The force curve for the involved knee may demonstrate a sudden abnormal drop in force output at a particular point in the range of motion. 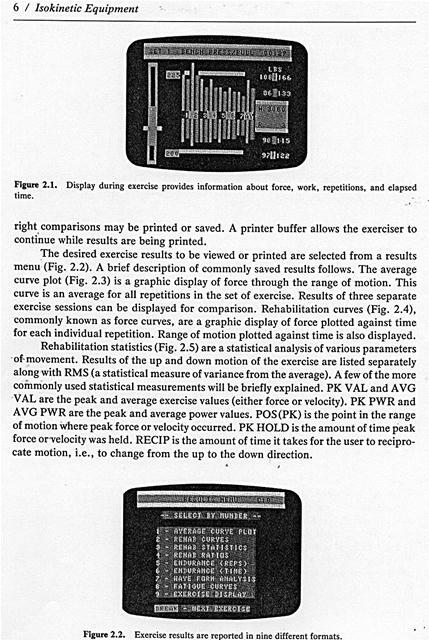 A tabular printout of force output every several degrees throughout the range of motion indicates exactly where the drop in force output occurred (Fig. 2.22). In programming the user diskette for rehabilitation, the operator can utilize this information to the maximal benefit of the user. The operator will set up a program to exercise the user at a variety of speeds isokinetically. To strengthen the knee extensors at their weak point in the range of motion, the diskette can be programmed for a slower speed at that point in the range of motion or an isometric contraction for up to 6 seconds (allowing more time for recruitment). This has been a very effective mode of operation for improving strength at specific points in the range of motion. The ability to monitor easily the total quantity of work and the average force through the range of motion have proven invaluable in our use of the CES. Average force through the range of motion may be a more important functional measure than peak force. In the case of knee testing and rehabilitation, peak force of the involved knee often equals the involved knee while there is still a deficit in total work and average force. Rehabilitation is not considered complete until these important measures are equal. A common use of the variable velocity mode of operation in our clinic is exercise involving acceleration through the range of motion. Strictly isokinetic exercisers are limited to fixed velocity. An exercise such as knee extension may begin at 60 degrees/ second and progress linearly to 220 degrees/second as the knee approaches full extension. This seems to simulate more closely the functional use of the extremity. In testing and rehabilitation, it is sometimes preferable to set resistance, allowing traditional "weight lifting" exercise. The exercise diskette is programmed in the variable velocity mode. Resistance level may be set to any weight by merely pressing a key rather than by manually adding weights to a bar. Further, this weight can be increased or decreased on each repetition without interruption. This is a particularly valuable option for directing exercise programs that will be performed on the weight lifting equipment found in most nonclinical settings. 1. 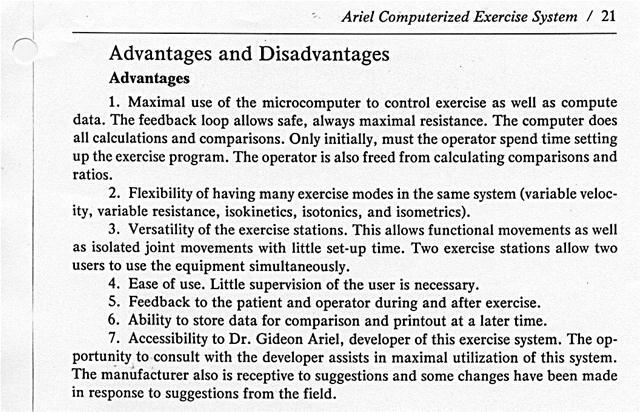 Maximal use of the microcomputer to control exercise as well as compute data. The feedback loop allows safe, always maximal resistance. The computer does all calculations and comparisons. Only initially, must the operator spend time setting up the exercise program. The operator is also freed from calculating comparisons and ratios. 2. Flexibility of having many exercise modes in the same system (variable velocity, variable resistance, isokinetics, isotonics, and isometrics). 3. Versatility of the exercise stations. This allows functional movements as well as isolated joint movements with little set-up time. Two exercise stations allow two users to use the equipment simultaneously. 4. Ease of use. Little supervision of the user is necessary. 5. Feedback to the patient and operator during and after exercise. 6. Ability to store data for comparison and printout at a later time. portunity to consult with the developer assists in maximal utilization of this system. in response to suggestions from the field. Generated on 4/22/2019 1:10:38 PM (PST) ADI/HQ/GBA/2019/ARIELCLOUD/v3.0.2018.0126.